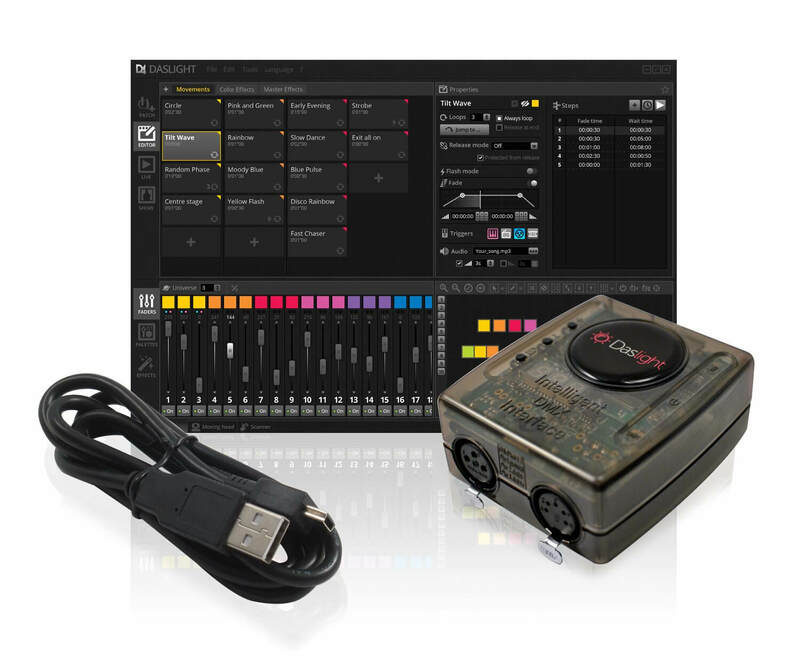 The Daslight DVC4 Gold is a USB interface that can be used with the Daslight 4 lighting control software. This Gold version of the interface gives you access to the software's full functionality, and does not limit the number of steps per scene or the number of scenes that can be used simultaneously. Using the software and this interface, you can create professional light shows and light plans that you can control on location with a laptop, or even a tablet or smartphone. Thanks to the powerful new software, the DVC4 Gold has an extensive library of over 15,000 fixtures on board! With the DVC4 Gold you can use all the functions that the Daslight 4 software has to offer, without any limitations. That means you'll have 1024 outgoing DMX channels at your disposal. Connect the DVC4 to a computer with the Daslight 4 software using a USB cable. While the software is free to download on the Daslight website, you'll need an interface such as this one to translate the data into a DMX signal. As such, the DVC4 Gold features a 3-pin XLR connector for both DMX in and DMX out. This allows you to connect an external interface to the controller, for an even more hands-on approach to controlling your light show. What's more, using the built-in memory you can store a show on the interface itself, allowing it to run your show without the need for a computer. This allows you to prepare a show or light plan at home, and bring only the interface to the venue. This is already the fourth generation of this very popular software package. It's been completely overhauled, and now features a library of over 15,000 fixtures, a completely new FX engine and integrated smartphone and tablet control. As such, it allows for a great, comprehensive way of controlling your lights during live performances or shows. You can create the entire light show from the comfort of your own home. Using a computer or laptop, you can create scenes and chases, and program the movement of your scanners and moving heads. What's more, it's possible to pre-render the entire show for a virtual preview. You can also use the software live, to choose and adapt scenes, making it a highly versatile package. Controlling the software can be done using various MIDI and DMX devices, and it's compatible with iPhones, iPads and Android devices.